The British Gazette » Lloyds Bank: Plan “A” does not appear to be working. Let’s try Plan “B”! 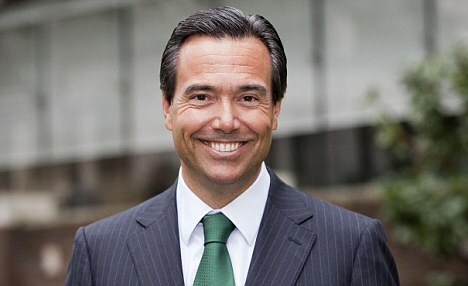 Above, António Horta Osório, CEO Lloyds Banking Group. Last Monday, the BG commented upon the possibility of the Lloyds Banking Group (http://www.british-gazette.co.uk/2018/01/29/1-158234-pence/) being subject to a takeover by a large US bank such as the Bank of America. Since the financial crisis and the arranged/shotgun marriage of the solvent Lloyds Bank and the insolvent Halifax/Bank of Scotland group, Lloyds has made great progress in turning a basket case that required underwriting by the taxpayer to a profitable bank with a strong balance sheet. This Herculean effort on the part of all Lloyds Bank employees has latterly been under the leadership of Senhor António Horta Osório a CEO who, unlike Madame Mayhem has been able to provide Lloyds with strong and stable leadership. Senhor António Horta Osório and his team have been doing all the right things in terms of reducing costs, increasing productivity (making the bank more efficient – more output for less input), improving margins and retaining market share. There have however been three particular flies in Lloyds Bank’s ointment. 1. The government stake. Under EU regulations, whilst the taxpayer owned shares in Lloyds, it was classed as a state supported enterprise. Happily this is no more. 2. PPI. The Financial Conduct Authority (FCA) has set a deadline of 29th August 2019, being the cut-off date for consumers to file claims. 3. The share price. A buoyant/high share price assists the bank and bolsters it’s balance sheet. Progress on #1 and #2 was good. Unfortunately, progress on #3 has been dismal. This through no fault of Lloyds. Senhor António Horta Osório and his team clearly have hoped that their progress on #1 and #2 will have ensured progress on #3. It hasn’t. Thus it comes as no surprise whatsoever that there are now reports that Lloyds intends to start a buy back programme of it’s own stock. As much as an extra 1.5 pence a share by way of a special dividend would be a very nice thing for shareholders such as your Editor. However, to use that money instead to buy shares into Treasury, buying back shares in these circumstances is a very good thing to do. This is because it reduces the bank’s costs as it no longer needs to pay out a dividend on those bought in shares. In accounting terms, paying dividends is a liability and reducing this liability strengthens the balance sheet. Because the assets of the bank end up being owned by a smaller number of shareholders, each shareholder gains – albeit to a minor extent. All of this does not lessen the risk of a takeover after August 2019. In fact, it makes it more likely. Thus it is that your Editor is not going to increase his shareholding in Lloyds as I do not want to be caned for any more CGT than I have to!